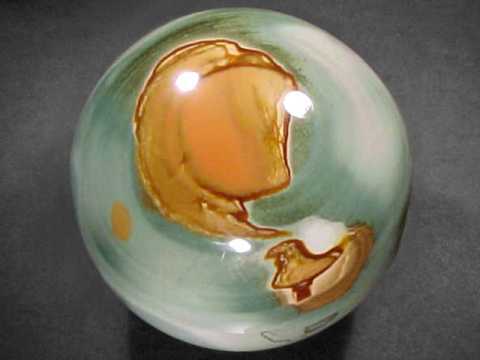 Try our Jasper Handcrafted Items Satisfaction Guarantee - compare our prices and our superior quality. Click on any handcrafted jasper decorator specimen image below to enlarge it. This natural color mookaite ring was handcrafted in sterling silver and set with a hand-ground and polished pear shape cabochon gem genuine Australian mookaite measuring 24x19mm. This natural color mookaite cabochon gem has shades of yellow, orange, and lavender-pink (all 100% natural colors). This ocean jasper pendant was handcrafted in sterling silver with an open back setting with a hand-ground and polished 20x16mm oval shape cabochon gem of natural "Ocean Jasper". 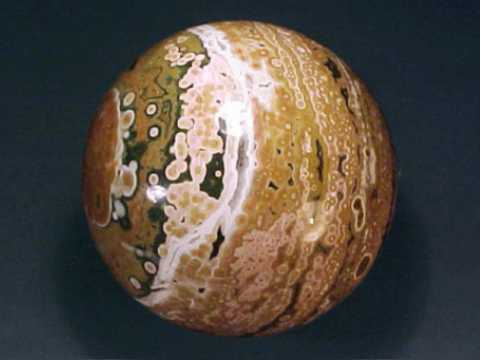 "Ocean Jasper" is a rare and beautiful orbicular jasper variety that is mined on the coast of Madagascar. The ocean jasper cabochon gem in this pendant has layered dots & bull's eyes in shades of green, orange-pink, and yellow (all 100% natural colors). This ocean jasper pendant was handcrafted in sterling silver with an open back setting. It is set with a hand-ground and polished oval shape cabochon gem of natural "Ocean Jasper" measuring 21x16mm. "Ocean Jasper" is a rare and beautiful orbicular jasper variety that is mined on the coast of Madagascar. The ocean jasper cabochon gem in this pendant has layered dots & bull's eyes in shades of green, orange-pink, white and yellow (all 100% natural colors). This ocean jasper pendant was handcrafted in sterling silver with an open back setting under a hand-ground & polished 27x19mm cabochon gem of natural "Ocean Jasper". "Ocean Jasper" is a rare and beautiful orbicular jasper variety that is mined on the coast of Madagascar. The ocean jasper cabochon gem in this pendant has layered dots & bull's eyes in shades of green, orange-pink, white and yellow (all 100% natural colors). This ocean jasper pendant was handcrafted in sterling silver with an open back setting. It is set with a hand-ground and polished cabochon gem of natural "Ocean Jasper" measuring 30x15mm. "Ocean Jasper" is a rare and beautiful orbicular jasper variety that is mined on the coast of Madagascar. The ocean jasper cabochon gem in this pendant has layered dots & bull's eyes in shades of green, orange-pink, and yellow (all 100% natural colors). 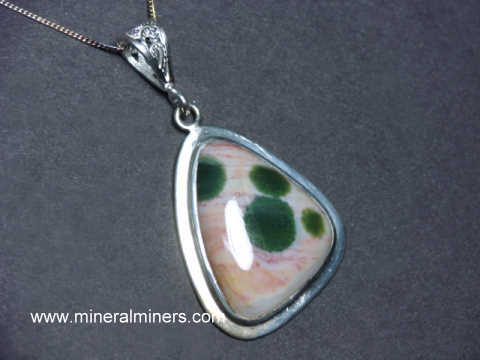 This large size kabamba jasper pendant was handcrafted in sterling silver. 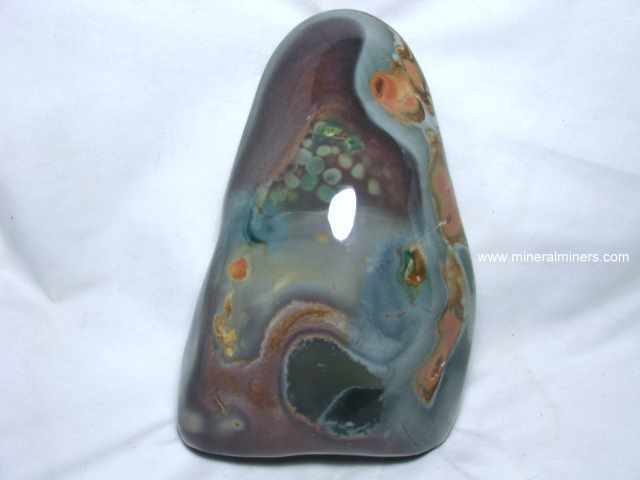 It is set with a large size oval shape cabochon gem of natural "Kabamba Jasper" measuring 41x25mm. 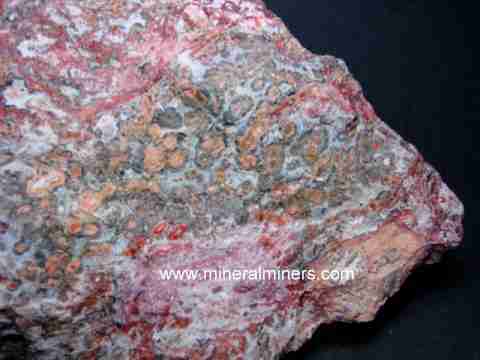 Kabamba jasper is a natural jasper that is found in Madagascar. This natural color mookaite pendant was handcrafted in sterling silver with an open back setting and set with a 25x17mm pear shaped cabochon gem of genuine Australian mookaite. This natural color mookaite cabochon gem has beautiful shades yellow and reddish-brown (all 100% natural colors). This mookaite pendant is displayed on a sterling silver chain that measures 18" long and is included with the pendant at no extra charge. This large ocean jasper pendant was handcrafted in sterling silver with an open back setting. It is set with a hand-ground and polished free-form shape cabochon gem of natural "Ocean Jasper" measuring 35x26mm. 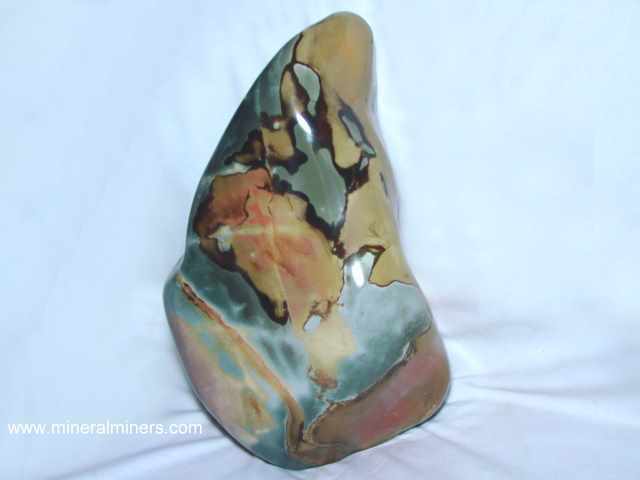 "Ocean Jasper" is a rare and beautiful orbicular jasper variety that is mined on the coast of Madagascar. Because it is exposed right where the ocean crashes on the rocks at sea level, this ocean jasper location can only be mined at low tide! This genuine ocean jasper jewelry design is set with a cabochon gem with bull's eyes in shades of white and orange-yellow in a green jasper background (all 100% natural colors). This natural color mookaite pendant was handcrafted in sterling silver with an open back setting and set with a 29x20mm pear shaped cabochon gem of genuine Australian mookaite. 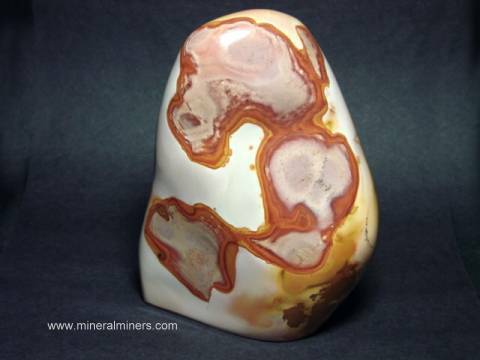 This natural color mookaite cabochon gem has unique patterns and shades of white, yellow, reddish-brown and lavender (all 100% natural colors). This beautiful pendant is displayed at left on a sterling silver chain that measures 18" long and is included with the pendant at no extra charge. This large size ocean jasper pendant was handcrafted in sterling silver with an open back setting under a hand-ground and polished oval shape cabochon gem of natural ocean jasper measuring 37x28mm. 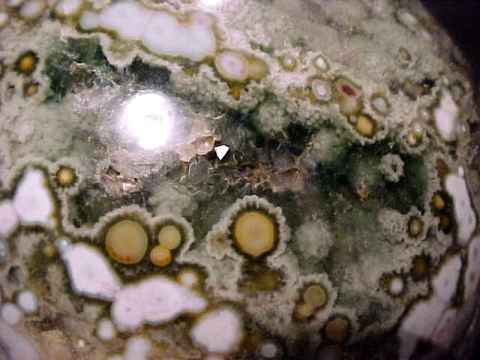 "Ocean Jasper" is a rare and beautiful orbicular jasper variety that is mined on the coast of Madagascar. The ocean jasper cabochon gem in this pendant has layered dots & bull's eyes in shades of green, orange-pink, white and yellow (all 100% natural colors). This pendant was handcrafted in sterling silver with an open back setting. 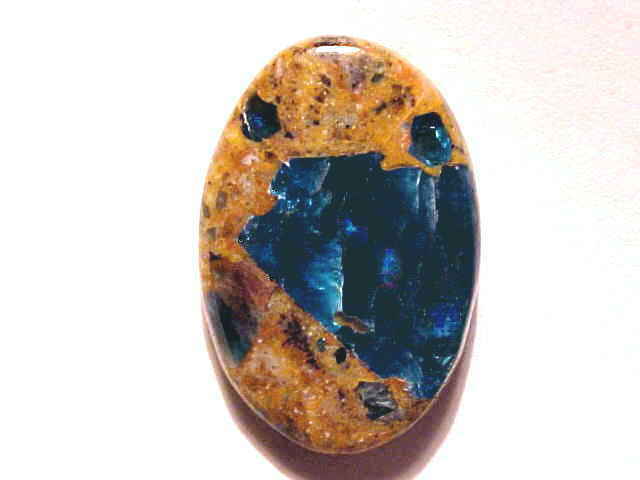 It is set with a cabochon gem of natural "Ocean Jasper" measuring 22x21mm. "Ocean Jasper" is a rare and beautiful orbicular jasper variety that is mined on the coast of Madagascar. The ocean jasper cabochon gem in this pendant has dots & bull's eyes in shades of green, white and yellow (all 100% natural colors). This beautiful pendant is hung on a sterling silver chain that measures 18" long and is included with the pendant at no extra charge. This large ocean jasper pendant was handcrafted in sterling silver with an open back setting and set with a cabochon gem of natural ocean jasper measuring 36x34mm. 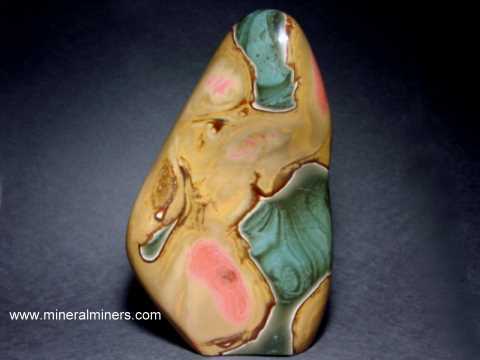 "Ocean Jasper" is a rare and beautiful orbicular jasper variety that is mined on the coast of Madagascar. The ocean jasper cabochon gem in this pendant has layered dots & bull's eyes in shades of green, orange-pink, white and yellow (all 100% natural colors). This natural color mookaite pendant was handcrafted in sterling silver with an open back setting and set with a 26mm round cabochon gem of genuine Australian mookaite. This natural color mookaite cabochon gem has shades of white, yellow-gold, orange-pink and reddish-brown natural colors! This unique pendant is displayed on a sterling silver chain that measures 18" long and is included with the pendant at no extra charge. This ocean jasper pendant was handcrafted in sterling silver with an open back setting. It is set with a hand-ground & polished leaf shape cabochon gem of natural color ocean jasper measuring 51x25mm. "Ocean Jasper" is a rare and beautiful orbicular jasper variety that is mined on the coast of Madagascar. The ocean jasper cabochon gem in this pendant has layered dots & bull's eyes in shades of green, orange, pink, white and yellow (all 100% natural colors). This extra large size mookaite pendant was handcrafted in sterling silver with an open back setting and set with a 29x34mm cabochon gem of genuine Australian mookaite. This natural color mookaite cabochon gem has very beautiful shades of white, yellow, orange, maroon, brown and red (all 100% natural colors). This unique mookaite pendant is displayed at left on a sterling silver chain necklace that measures 18" long and is included with the pendant at no extra charge. This ocean jasper pendant was handcrafted in sterling silver with open back settings. It was set with a beautiful pear oval cabochon gem of natural "Ocean Jasper" measuring 27x19mm, and also set with two 5mm round faceted peridot gems. This pendant was then set with a pair of 6mm square shaped faceted golden citrine gemstones. The ocean jasper cabochon gem in this pendant has dots & bull's eyes in shades of green, pink, white and yellow (all 100% natural colors). This extra large size mookaite pendant was handcrafted in sterling silver with an open back setting with a 39x30mm pear shaped cabochon gem of genuine Australian mookaite. This natural color mookaite gem has shades of white, greenish-yellow, orange and reddish-brown (all 100% natural colors). This unique mookaite pendant is displayed on a sterling silver chain necklace that measures 18" long and is included with the pendant at no extra charge. This extra large size natural mookaite necklace was handcrafted in sterling silver with an open back setting and set with a 38x28mm oval shaped cabochon gem of genuine Australian mookaite. This natural color mookaite cabochon gem has shades of pink, yellow-gold and reddish-brown (all 100% natural colors). This beautiful mookaite pendant is displayed at left on a sterling silver chain that measures 18" long and is included with the mookaite pendant at no extra charge. This large jasper pendant is 2.6 inchers long! It was handcrafted in 925 sterling silver with open back settings. This unique pendant is set with a polished slice of natural black and white jasper measuring 40x13mm, and also with a 6mm round faceted gem of natural colorless quartz crystal. This pendant is also bezel set up at the top with a genuine sikhote-alin meteorite measuring 13x11mm! The photo at left shows a close-up. 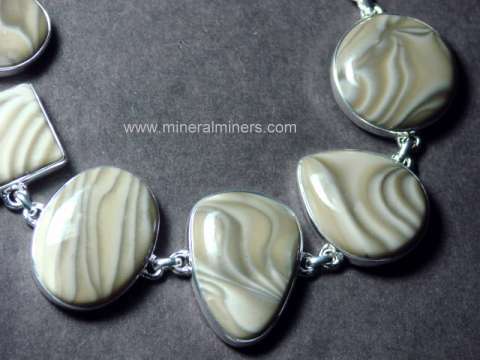 See also a full view of this natural color jasper jewelry design. This genuine mookaite bracelet was handcrafted in sterling silver with solid back settings. It is set with five round cabochon gems of natural color Australian mookaite measuring from 10mm in diameter up to 16mm in diameter. These genuine mookaite cabochon gems have shades of -pink-orange, purple, yellow, white and maroon natural colors! The photo at left shows a close-up, see also a full view photo of this natural color mookaite bracelet. This genuine mookaite bracelet was handcrafted in sterling silver with solid back settings. It is set with five round cabochon gems of natural color Australian mookaite measuring from 11mm in diameter up to 16mm in diameter. These natural color mookaite cabochon gems have shades of pink-orange, reddish-brown, yellow and white (all 100% natural colors). The photo at left shows a close-up, see also a full view photo of this natural color mookaite bracelet. This bracelet was handcrafted in 925 sterling silver with open back settings. It is set with five hand-ground and polished cabochon gemstones of natural "Ocean Jasper"; three oval shapes and two pear shapes measuring from 22x26mm up to 27x19mm. "Ocean Jasper" is a rare and beautiful orbicular jasper variety that is mined at a single location on the coast of Madagascar. Because it is exposed right where the ocean crashes on the rocks at sea level, this jasper can only be mined at low tide! The ocean jasper cabochon gemstones in this bracelet have layered dots & bull's eyes in shades of green, yellow-orange, white, and pink (all 100% natural colors). The photo at left shows a close-up. See also a full view of this unique ocean jasper bracelet. This bracelet was handcrafted in sterling silver with open back settings. It was set with five hand-ground and polished free-form shape cabochon gemstones of natural "Ocean Jasper" measuring from 25x18mm up to 33x20mm. "Ocean Jasper" is a rare and beautiful orbicular jasper variety that is mined at a single location on the coast of Madagascar. Because it is exposed right where the ocean crashes on the rocks at sea level, this jasper can only be mined at low tide! The ocean jasper cabochon gemstones in this bracelet have layered dots & bull's eyes in all 100% natural colors. This kabamba jasper bracelet was handcrafted in sterling silver. 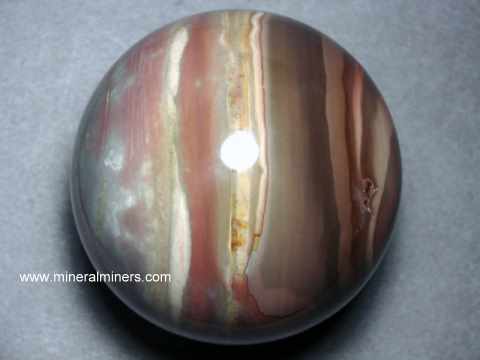 It is set with 5 large cabochon gems of natural color "Kabamba Jasper" ranging in size from 28x21mm up to 33x25mm. 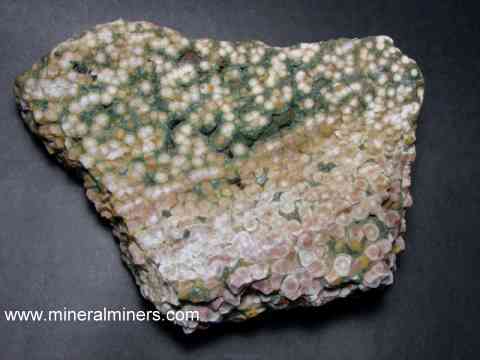 Kabamba jasper is a natural jasper that is found in Madagascar. See also a full view of this unique kabamba jasper jewelry design. Our handcrafted jasper items are all 100% natural color jasper! 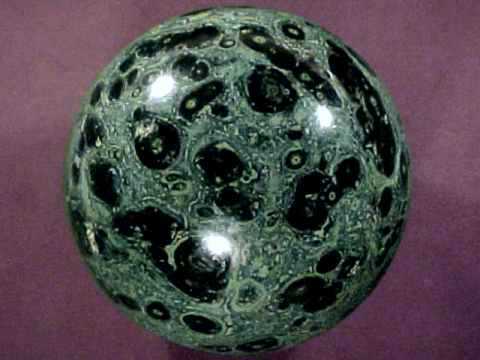 See our hand-picked selection of unique handcrafted jasper spheres including some very beautiful ocean jasper spheres. 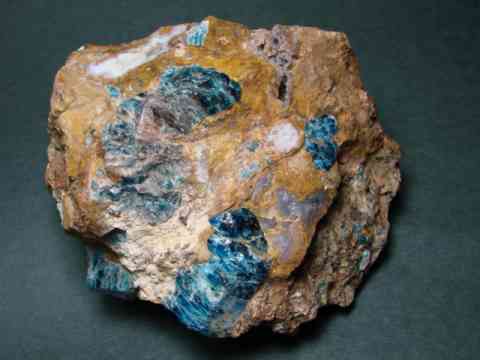 We also have handcrafted gifts of many other natural mineral varieties available! Each of our handcrafted jasper items is untreated & unheated natural color jasper! Would you like us to inform you when we add on this page more natural jasper carvings, sculptures, and other handcrafted jasper items? We do have additional hand carved jasper sculptures in stock at our mineral warehouses, so be sure to let us know if you have any special requests.